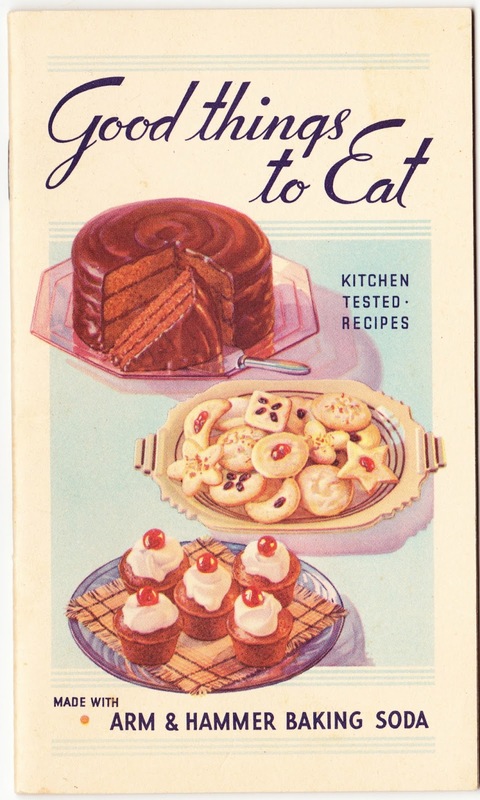 "Good things to Eat" is a 3¼-inch-wide, staplebound, 32-page booklet published in 1935 by Church & Dwight Co., makers of Arm & Hammer baking soda. The booklet suggests that the recipes can be made with either Arm & Hammer or Cow Brand baking soda. All of the recipes were tested and approved by Martha Lee Anderson. "Do you know the secret of Chocolate Cake, rich and delicate in flavor, soft and silky in texture? Do you know the secret of Gingerbread that has the penetrating aroma, the true, deep, rich, golden color? "If you know these things, you know Baking Soda and the part it plays in making baking day a pleasure with success assured." Sift flour once, measure, add baking soda, salt and spices and sift together three times. Work butter with spoon until creamy. Add sugar gradually, beating after each addition until light and fluffy. Add eggs. Add raisins and nuts. Add flour alternately with tomato juice, a small amount at a time, beating until smooth after each addition. Turn into greased cup cake tins and bake in a moderate oven (375° F.) 25 minutes or bake in loaf pan (6" x 10") at 350° F, for 45 minutes. Frost with Confectioners Frosting. Sift flour once, measure, add baking soda and salt, and sift together three times. Beat sugar gradually into sour cream. Add egg. Add chocolate. Blend well. Add flour alternately with milk, a small amount at a time, beating until smooth after each addition. Add vanilla. Turn into two greased 9 inch layer pans. Bake in moderate over (325° F.) for 25 minutes. Frost with Boiled Frosting.